The ISM Summer University in the Baltics has already attracted more than 300 students coming from Europe, Asia, Australia and the USA since 2012. 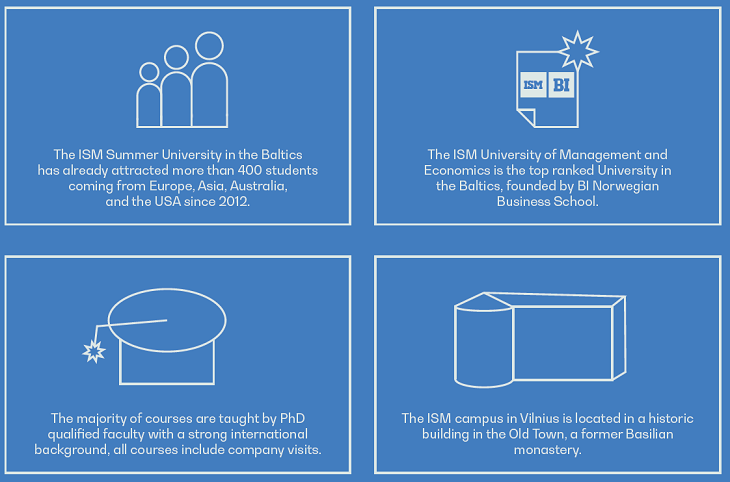 The ISM University of Management and Economics is the top-ranked University in the Baltics, founded by BI Norwegian Business School. The ISM campus in Vilnius is located in a historic building in the Old Town, a former Basilian monastery. The majority of courses are taught by PhD qualified faculty with a strong international background. All courses include company visits. The New York Times put Vilnius on the list of the cities that aim to be both smart and well managed, yet have an undeniably hip vibe (www.nytimes.com). 1st in Europe for density of network of public Internet access points and upload speed. The largest old town districts in Eastern Europe, UNESCO world heritage site. Lithuania has beautiful nature - BBC filmed much of its recent War and Peace drama here. 62 % of citizens either walk, bike or take a bus as a mode of transportation. It was once the largest country in Europe. Among the Top 40 countries in the World for the quality of life. The programme also includes a weekend trip to the Lithuanian seaside, local and multinational company visits, exciting cultural and social activities. * The Total number of courses offered will depend on the quantity of participants. 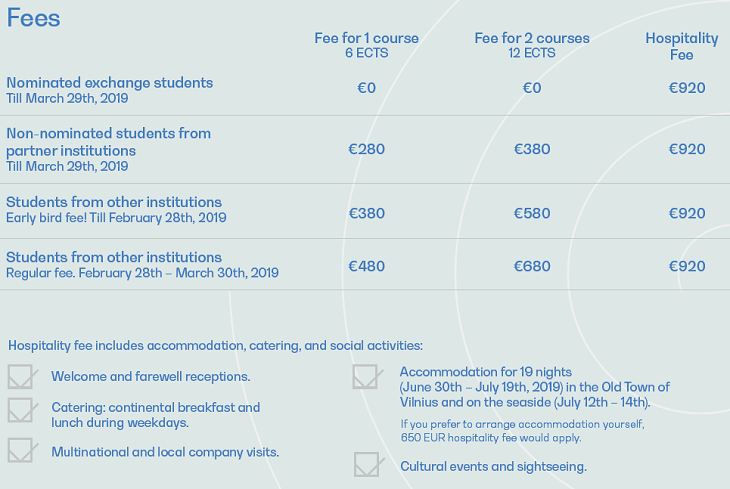 The final application deadline for the ISM Summer University in the Baltics is the 29th of March, 2019.